“Make a legal u-turn”, “Recalculating”, “Address cannot be found”, Ahhh the GPS. The device we all love to hate. 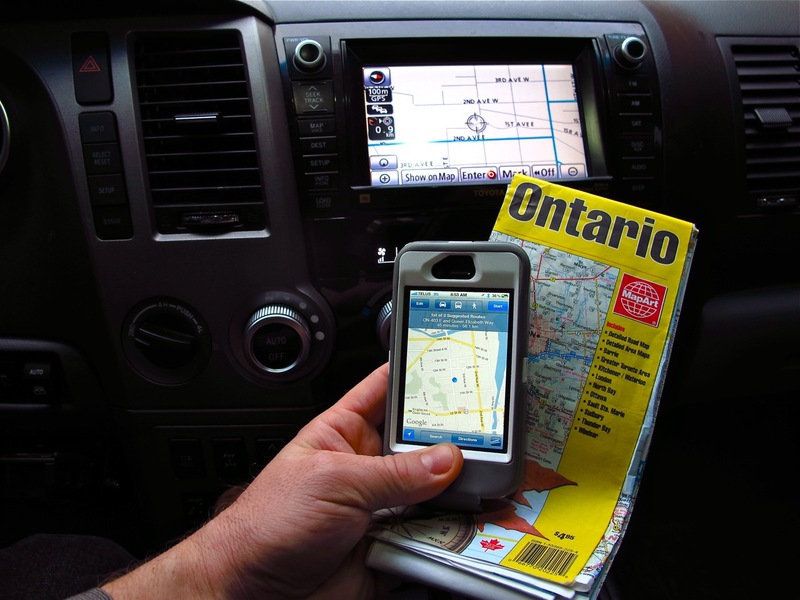 The GPS or global positioning system has already become the go to source for navigational assistance. It’s coming standard in our cars, adaptable for our snowmobiles and motorcycles, and is even in our pockets at all times as a built in feature on most smart phones. It’s used almost religiously for things like finding an arena in a small town, to buy something off Kijiji, to find an address at night down a dark country road, or just to find that little café everyone’s raving about in the city. It’s become a necessity, just like the phone book or paper map used to be. But is it really good for tourism? Lets navigate our way through some of the pros and cons. Pro: Reduces the number of in car domestic disputes while navigating. Con: Increases the number of in car domestic disputes when things go wrong with the GPS. Pro: Creates the most efficient direct route to the motel you just booked. Con: It means you don’t stop to see anything along the way, as you are too afraid to deviate off the GPS course even if the kids have to pee. Pro: You can get to places without any previous knowledge or research about location, as you just punch the address into the GPS and it does the thinking for you. Con: You know absolutely nothing about the destination or places along the way as you have done no research. Pro: You save trees as you never touch another paper map again. Con: What do you use when your GPS malfunctions? Pro: Smart phones with integrated GPS and Google maps mean you only need one device to get you there. Con: What if you don’t have service and you forgot your charger? Pro: With Bluetooth technology, motorsports enthusiasts can have turn-by-turn directions audible right inside their helmet. Con: Directions get in the way of the sound of your motorcycle and having someone tell you what to do is just not cool. Pro: You can select a voice that best suits your personality. Con: When you start to talk back to the voice in the same accent, you might have a problem. As you can probably tell, I still think there is an important place for other navigational aids such as the paper map in today’s travel world. As a route developer, we always want to encourage people to slow down, explore their surroundings or places en route to their destination. When everyone is on ‘autopilot’, just listening for that next turn direction from their cars speaker system, we really question how much they are getting from their surroundings. How many times have you put all your faith into your GPS, gotten to your destination and realized you have no idea where you actually are. Scary feeling right? Highway Signage – Still Necessary? Some people now argue that highway signage is becoming less important as the GPS becomes more prevalent with drivers. I say the exact opposite. They create a sense of comfort with travellers knowing they are on the right path, and if and when the GPS malfunctions they are an important safety back up. More importantly are the attraction signs found along the route. As mentioned above people are doing less and less research about how to get to their destination, therefore are missing the opportunity to learn about any hidden gems or attractions along their satellite-aided path. Highway signage, can instantly tell people that a scenic lookout, famous butter tart bakery or historic downtown district is coming up on your left. But signs only work if drivers are paying attention to the road and not their in-dash GPS screen. As we all know, travel is all about the journey, exploring destinations, seeking out new experiences, all that are away from home, outside of your familiar comfort zone. The GPS is certainly making the navigational portion of travel easier and more comfortable. Is the printed map and old-fashioned road signage dead? We think not.